Winters can be a tough time for your roof. When heavy snow accumulates on your roof, its weight causes your roof a great deal of stress. A novice snow removal team will not understand the complexities and hazards on your roof and can oftentimes do more harm to your roof than good. Don’t put your people or property at risk. 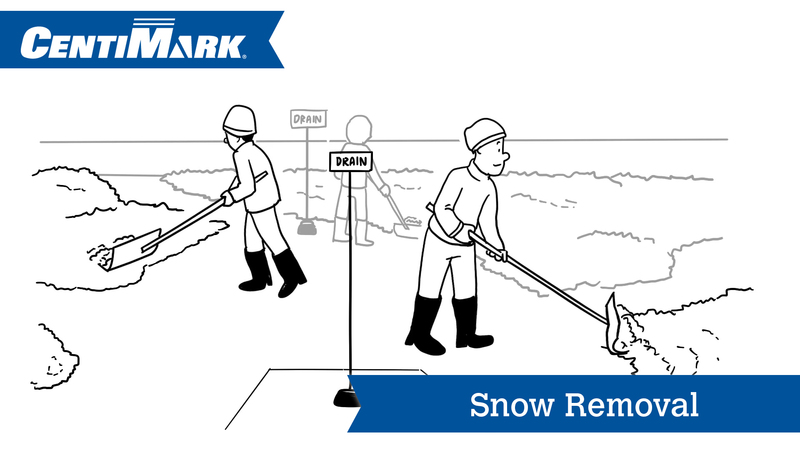 Make sure you are signed up for CentiMark’s Rooftop Snow Removal Services. Just read through the Snow Removal Waiver, sign and return it and you will be at the top of our list. With hundreds of calls coming in after a heavy snowstorm, priority scheduling will be critical for your roof! Snow Guards – On sloped roofs, they hold the snow at the edge or peak of a roof allowing the snow to melt gradually. This prevents a massive amount of snow from sliding off the roof and causing unsafe conditions on the ground below. 1Factors such as how your building was designed, constructed and what modifications have been made affect how much weight your structure can sustain. 2One inch of wet, dense snow is equal to 1.66 pounds per square foot. So if you get six inches of snow, you have 9.96 pounds per square foot. If your roof is 50,000 square feet you have 498,000 pounds of load on your roof! 3Snow drifts affect the total weight being applied to your roof by placing a disproportionate amount of weight in certain areas of the roof. 4If snow melts and then refreezes, ice can slow or eliminate the ability of the roof to drain properly, causing dangerous weight amounts on the roof.